When the San Diego chapter of Travel Massive, a global community of travel industry insiders, leaders, and innovators, planned a trip to Temecula, I thought I had been everywhere in this town and would be revisiting many places I currently gather with friends. I was wrong. I learned new places in my hometown that I will now share with friends. We were invited to Temecula to help celebrate the 50thanniversary of wine country. Gentlemen wine farming started in this valley in 1968 with Vince and Audrey Cilurzo planting the first vineyards. Temecula wine country adds $78 million a year to the regional economy. 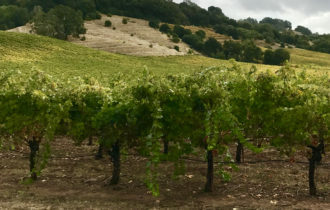 The success of good winemaking comes from a Mediterranean climate brought about by both the Santa Margarita Gap and Rainbow Gap. In the year 2020, this area is zoned for 105 wineries. Our day started out at Vitagliano Vineyards & Winery. Guy Vitagliano came from Salina, Italy where he brought a dream of wine making to America. 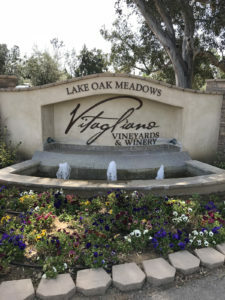 Now in its third generation of the family, grapes reminiscent of Guy’s native Italy have been planted and wines bottled to be enjoyed at Vitagliano. The exquisite grounds provide the perfect setting for weddings and other memorable events. Tastings of their Super Tuscan wines are available Wednesday, Friday, Saturday and Sunday. I suggest you call ahead and make sure they don’t have an event planned. We were treated to a wine tasting of all of these Super Tuscans as well as a fun lunch provided by Devilicious from their traveling food truck that was brought to Vitagliano. 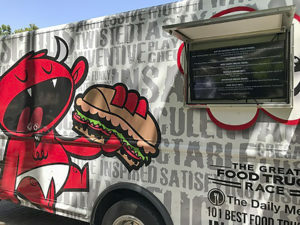 Whenever I have the opportunity to choose something from Devilicious Eatery, I always choose the Butter Poached Lobster Grilled Cheese–butter poached lobster tail, caramelized onions and tomatoes, jack and cheddar cheeses, on sourdough. Of course I couldn’t overlook the Truffle Parmesan Fries, a perfect accompaniment. The Baked Bear food truck was also on the ground to provide custom ice cream sandwiches. My choice was a macadamia white chocolate cookie filled with salted caramel ice cream and topped with a brownie cookie. Pure indulgence! After all this eating, we needed to find a cocktail or two. Who knew that Temecula was home to at least three speakeasies? Our van pulled up to Devilicious in Old Town Temecula. Inside we found a well-kept secret of a hidden speakeasy where we would meet Mo, a mixologist extraordinaire! The Apparition Room was just as I would expect a speakeasy—dark, small, intimate—and decorated with 1920’s touches like an old Victrola and pictures from the past. Mo’s knowledge of drinks fascinated us. He asked what we liked in a cocktail and then specifically prepared one created just for each of us. 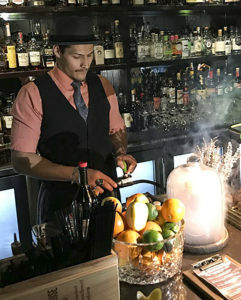 His use of smoke that filled a glass dome with a cocktail inside left us in awe! 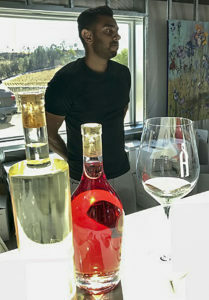 We discovered a new winery cropping up in the wine country of Temecula called Akash Winery. This winery is owned and operated by father and son Ray and Akash Patel. Akash Winery was started in 2012 with the planting of 20 acres of grapes at 39730 Calle Contento in the heart of wine country. The vineyard is planted in Cabernet Sauvignon, Petite Sirah, Sauvignon Blanc, and Zinfandel. They are open by appointment seven days a week. We were off to Refuge Brewery, home to handcrafted Belgian ales with interesting beers like the Blood Orange Wit, Grapefruit IPA, and West Coast Red. 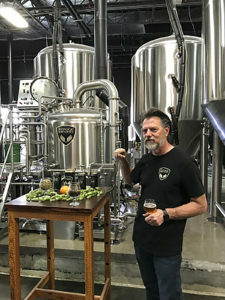 The brewery provides a casual setting where you can try a variety of these beers and play a few games at the same time while munching on popcorn. The next stop for our group was Pechanga Casino and Resort. The casino and resort has long been a destination for travelers to the Temecula area. Pechanga is the largest casino on the West Coast and is owned and operated since 2002 by the Pechanga Band of Luiseño Indians. The casino and resort just went through a major expansion and now has 1090 guest rooms available. 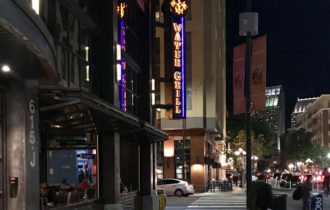 The restaurants at this casino are varied but provide guests with some delicious options from a buffet to a sushi restaurant. 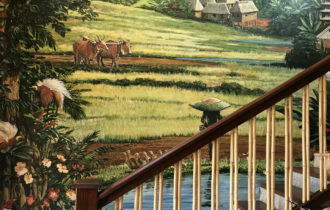 The latest restaurant to open is the Lobby Bar & Grill where guests can try farm to table ingredients in a casual atmosphere. 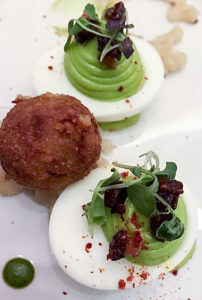 A fun appetizer on the menu is the Green Deviled Eggs and Ham, a green deviled egg with a ham croquette. When it came time to order our main course, I couldn’t resist the Pan Seared Shrimp & Grits. Delicious! The pièce de résistance of the new expansion is the spa and pool area. 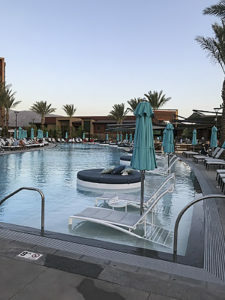 This is not just a pool area—this makes Pechanga the resort of your dreams! The world-class 25,000 square foot spa area with 17 treatment rooms espouses peacefulness and understated luxury with its own pool area. 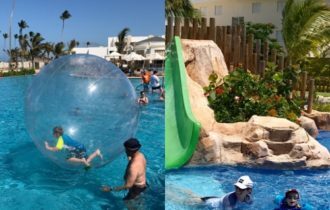 There is an adults-only pool with a swim-up bar as well as a family pool area with two large slides and a splash pad. Twenty-seven cabanas and six round day beds located in the largest pool await guests. The Cove sits on 4.5 acres and provides the perfect tropical oasis for a getaway. Sign me up! As is customary in this industry, members of Travel Massive were hosted during our day in Temecula, but the delight I experienced learning about what was new in my hometown is evident in my writing. I love discovering new things about my hometown too. I just recently did a walking tour of a neighbourhood in my city and it was a huge eyeopener for me. Sometimes tourists know more about our towns than we do! 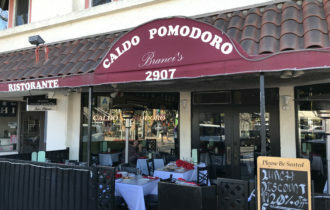 I have been to Temecula but not experienced these particular restaurants and entertainment spots. I love having new ideas to try. The article was well written and so informative. Thank you, Rita. Yes, there are many fun things to do in Temecula. You need to visit soon. Copyright © 2019 Toasting Food, Wine & Travel. All Rights Reserved.